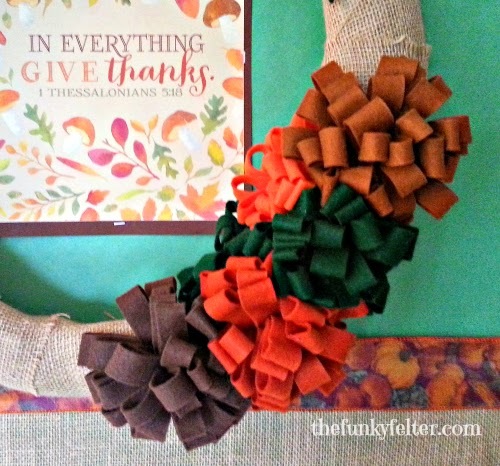 Upcycle your summer pool noodle into this Autumn decoration! I'm a little obsessed with all things Fall right now, especially wreaths. After I found out I could make a cheap wreath base (less than a few bucks!) from a pool noodle thanks to Pinterest, I have been experimenting right and left with these handmade decorations. 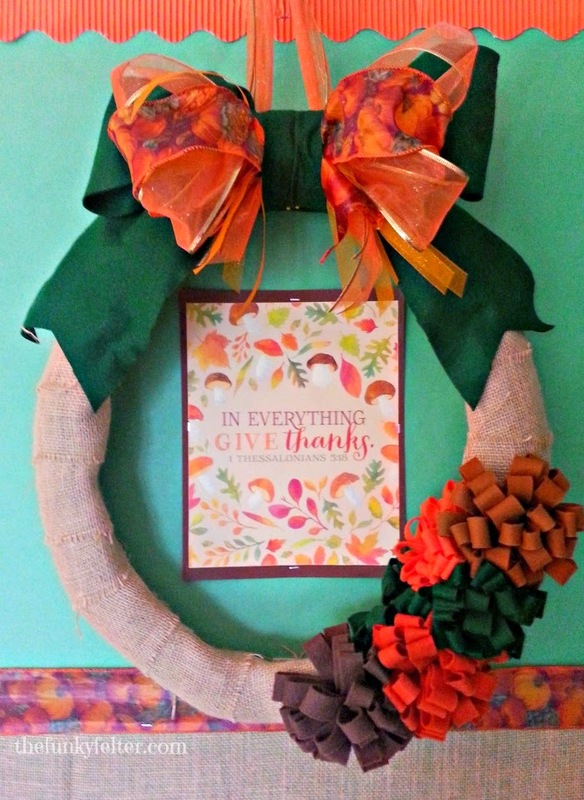 The "Give Thanks" themed wreath above, I actually made for a bulletin board at my church. I've also decorated bulletin boards at my daughter's school and really enjoy volunteering my time for such crafty things. After hanging the wreath on the board at church, my daughter helped me finish putting up little cutout pumpkins and leaves all around it for a great mommy-daughter activity. I feel it is also good to show her to use her talents and time wisely to bless others as often as possible. We all have different gifts to share with our family, church and community. For the wreath above, you can find out how to make the hand sewn felt flowers here and how to make the burlap covered pool noodle base here. And the beautiful free printable "Give Thanks" verse from I Thessalonians 5:18 is compliments of Three Little Monkeys Studio. A big thanks for creating such a pretty piece for everyone to use! I think it really helped to put a pretty finishing touch on the bulletin board my daughter and I created.